The William Caslon Company published three mysteries in its short period of existence, but they had plans for others. The three books shown below came out in 1936, but I have in my possession a catalog of forthcoming books for 1938. 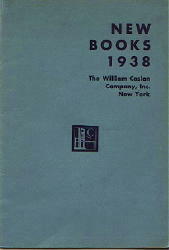 The reason for the skipped year and for the fact that none of the announced 1938 titles was actually published may be the same that Gateway Books had when they skipped a year of production in 1941: financial problems which led first to a suspension and then the eventual demise of the Caslon imprint. 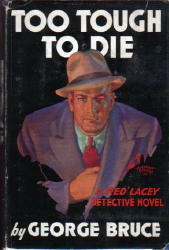 Of the three mystery novels that Caslon did publish, George Bruce’s Too Tough to Die is not a novel, as the cover states, but a collection of four Red Lacey novelettes originally published in Popular Detective. 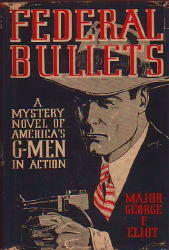 The two Elliot novels first appeared as lead Dan Fowler novels in G-Men. Caslon may or may not have been, like Gateway, a subsidiary of Standard Magazines. 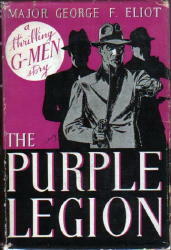 Given the fact that the three mysteries and the Westerns published under the Caslon imprint all had their origins in Thrilling Group pulps, there had to be some connection. Further evidence is that one of the novels announced in the 1938 Caslon catalogue, Edward Churchill’s flying romance Wings to the Sun, was in fact published under the Gateway imprint in 1940. 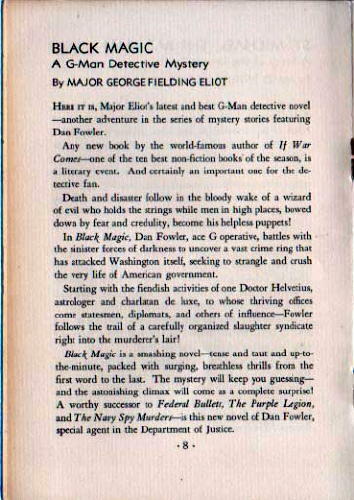 Re the catalogue: As far as I know, Black Magic by George Fielding Eliot never appeared – a pity because the catalogue copy makes it seem like good pulp fun in the vein of Eliot’s other Dan Fowler mysteries. 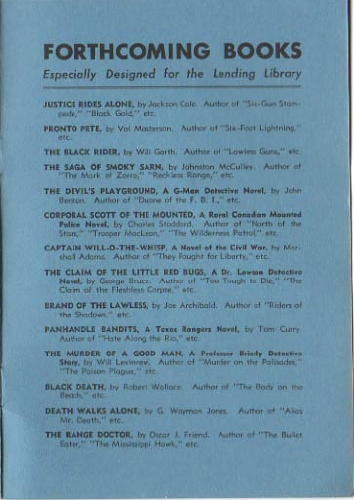 Also never published, at least under the announced titles, were any of the mysteries listed on the “Forthcoming Books” page: The Devil’s Playground by John Benton, Corporal Scott of the Mounted by Charles Stoddard, The Claim of the Little Red Bugs (a great title!) by George Bruce, The Murder of a Good Man by Will Levinrew, Black Death by Robert Wallace, and Death Walks Alone by G. Wayman Jones. Never published, that is, except in the pages of Standard Magazines pulps. HERE IT IS, Major Eliot’s latest and best G-Man detective novel -- another adventure in the series of mystery stories featuring Dan Fowler. Any new book by the world-famous author of If War Comes – one of the ten best non-fiction books of the season, is a literary event. And certainly an important one for the detective fan. Death and dusaster follow in the wake of a wizard of evil who holds the strings while men in high places, bowed down by fear and credulity, become his helpless puppets! In Black Magic, Dan Fowler, ace G operative, battles with the sinister forces of darkness to uncover a vast crime ring that has attacked Washington itself, seeking to strangle and crush the very life of American goverment. Starting with the fiendish activities of one Doctor Helvetius, astrologer and charlatan deluxe, to whose thriving offices come statesmen, diplomats, and others of influence – Fowler follows the trail of a carefully organized slaughter syndicate right into the murderer’s lair! Black Magic is a smashing novel – tense and taut and up-to-the-minute, packed with surging, breathless thrills from the first word to the last. The mystery will keep you guessing – and the astonishing climax will come as a complete surprise! A worthy successor to Federal Bullets, The Purple Legion and The Navy Spy Murders – is this new novel of Dan Fowler, special agent in the Department of Justice. JUSTICE RIDES ALONE, by Jackson Cole. Author of “Six-Gun Stampede,” “Black Gold,” etc. PRONTO PETE, by Val Masterson. Author of “Six-Feet Lightning,” etc. THE BLACK RIDER, by Will Garth. Author of “Lawless Guns,” etc. THE SAGA OF SMOKY SARN, by Johnston McCulley. Author of “The Mark of Zorro,” “Reckless Range,” etc. THE DEVIL’S PLAYGROUND, A G-Man Detective Novel, by John Benton. Author of “Duane of the F.B.I.,” etc. CORPORAL SCOTT OF THE MOUNTED, A Royal Canadian Mounted Police Novel, by Charles Stoddard. Author of “North of the Stars,” “Trooper MacLean,” “The Wilderness Patrol,” etc. CAPTAIN WILL-O-THE-WISP, A Novel of the Civil War, by Marshall Adams. Author of “They Fought for Liberty,” etc. THE CLAIM OF THE LITTLE RED BUGS, A Dr. Lawson Detective Novel, by George Bruce. Author of “Too Tough to Die,” “The Claim of the Fleshless Corpse,” etc. BRAND OF THE LAWLESS, by Joe Archibald. Author of “Riders of the Shadows," etc. PANHANDLE BANDITS, A Texas Rangers Novel, by Tom Curry. Author of “Hate Along the Rio,” etc. THE MURDER OF A GOOD MAN, A Professor Briarly Detective Novel, by Will Levinrew. Author of “Murder on the Palisades,” “The Poison Plague,” etc. BLACK DEATH, by Robert Wallace. Author of “The Body on the Beach,” etc. DEATH WALKS ALONE, by G. Wayman Jones. Author of “Alias Mr. Death,” etc. THE RANGE DOCTOR, by Oscar J. Friend. Author of “The Bullet Eater,” “The Mississippi Hawk,” etc.